In my last two blog posts, I shared a story about the worst customer service I had ever experienced. Then I followed that with introducing three techniques to improve and enhance customer service skills: Clarity, Character and Cultivate. For me, the character of customer service is how you internalize the situation and believe in the solution, otherwise how can you make it happen? Your goal is to help people for the sake of helping them, expecting nothing in return – Nothing! One example that I personally experienced occurred while I was driving in my car, during rush hour traffic, in Chicago! Now, I like giving people breaks in traffic. I slow down, motion to the driver to move into my lane – all with a smile on my face. I feel good about helping. But I have to admit that it really irks me when they don’t even acknowledge me with a thank you wave! Really? You can’t even say thank you??? But then I had to ask myself, why am I doing this? Am I doing it to be nice or to get a thank you. I had to look at this with a new perspective. Listen with a goal of totally understanding your client’s point of view, without judgment. The key phrase here is without judgment. Let the client be a part of the solution. Ask your client what they think would be a good solution. Even if they say something you can’t do, respond by saying: “Even though this is not possible, this is what I can do.” Offer an alternative. Keep looking for new ideas to resolve the situation until you are both satisfied. Good customer service can be hard because you have to put aside your own needs and “issues.” Next week we’ll talk about Cultivate and you will then have three powerful techniques that will help to enhance the great service you already offer. Last week I told a true story of the worst example of customer service I have seen in a long time. 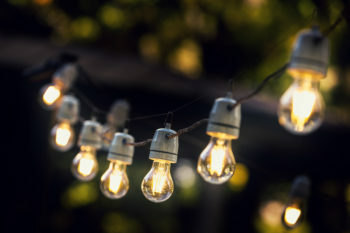 While my friends and I were dining outside on a lovely summer evening, the lights strung above our heads came crashing down, spewing broken glass and sparks everywhere. Literally – on our heads!!! The owner came out and was more interested in moving the chairs, never even asking if anyone was hurt. 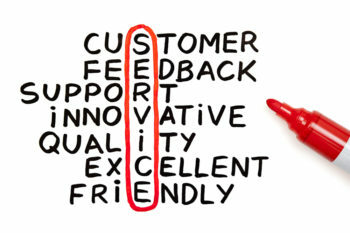 I have found that Clarity, Character and Cultivate are used in every form of great customer service. Let’s talk about the first. Clarity: It’s taking the time to find out what the real problem is; knowing that your goal is to solve that problem. There is one word, and one word only, that will help you get the greatest clarity on your situation at hand. LISTEN. In this day of instant everything, we are all tempted to multitask. There is so much we need to keep up with – emails, texts, social media. Heck, if you walk away from your computer to get a cup of coffee, you come back to 50 new emails you have to deal with. So it’s very tempting to look at those emails while you are talking to a client on the phone. But if you are distracted, you are not totally absorbing what they are saying, or listening to the key words that can uncover what their real problem is. One way to force yourself to listen is to take notes. Writing versus typing helps you remember the situation better and gives you more clarity. 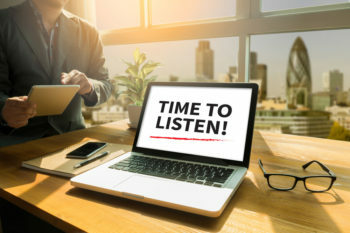 It will help you to truly listen to your client . I know this sounds crazy, but give it a try. See if it helps you listen better and gain more clarity so you can deliver extraordinary customer service. Well, it seems like we’ve run out of time on this blog post, so I’ll save Character and Cultivate for next week. In the meantime, practice clarity. Let me know how that works for you. It was a night to celebrate. My dear friend just became a grandfather for the first time and he wanted to treat us to our beverage of choice. Since he is Irish, we headed to the nearest Irish Pub and he ordered Guinness for everyone. We were all laughing, toasting and enjoying our friendship, when suddenly the lights that were strung above our heads came crashing down – broken glass and sparks flying everywhere. The strand landed between my two friends and it was truly a miracle, kismet, or whatever you want to call it that no one was hurt. What amazed me, though, was the reaction of the owner. We were the only group sitting on the patio at this point, so the server calmly walked into the restaurant and called the owner. When she saw what happened, she quietly asked “are you ok?” Then, without even waiting for an answer, she started rearranging the chairs on the patio. Wait! That’s it!!! As one friend was holding her hand to see if any glass had wedged itself under her skin, and another friend was brushing broken glass from her purse and from of her dress, the owner was moving chairs around??? Her lack of emotion and compassion still astounds me. I wanted to scream: “Can I see your manager? I want to talk to someone who cares!” but there she was – the boss, the owner, the person in charge – and she couldn’t care less. Understanding and practicing each of these will guarantee that your clients or customers will never suffer the lack of consideration that we did. Stay tuned next week and I’ll give you more information on each. It’s good stuff and something you can start using immediately even at home with your family. Have you ever dreamed of something – hoped for it, saved for it, imagined it – only to find out it wasn’t all it was cracked up to be? That’s what happened to me on my recent trip to Italy. You see, years ago I heard about an area called Cinque Terra. It was described as a rugged portion of the coast on the Italian Riviera with five villages built into the cliffs. It sounded so romantic, and any photo I saw of the area was breathtaking. I just had to go and experience it for myself. So I saved and waited and saved some more. And when I arrived, this is what I saw! 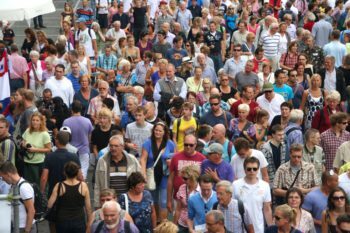 Hordes and hordes of tourists – so many that you could hardly move. I learned later that each of the five towns has about 400 residents each, yet every year they have 1.2 billion visitors. That’s billions with a capital B. You had to fight your way to get on the trains, and sometimes the hiking trails were so crowded you were at a total standstill. So much for my vision of sitting at a local cafe, sipping a cappuccino with the Italian residents. Now, don’t get me wrong. It was still beautiful – just not the way I had imagined it. So what do you do? How do you handle a situation like this? Now it’s your turn to fill in the blank. No matter what is happening around you, good or bad, there is always something to be grateful for. What memories will you choose to make?